What’s new in the world of brand and culture? What’s the latest scoop on companies like Uber, Salesforce, and others featured in FUSION? Check out the updates below. Although March 13, 2018 is the publication date for FUSION, I had to submit the manuscript for the book back in September, 2017. Since the business landscape is always evolving and new developments arise every day, I want to report on what’s happened with the organizations and on the topics covered in the book in the meantime — and continue to keep you updated with the latest insights and news. This page contains brief updates and links to the latest information — scroll down to read new updates. Sign up to receive a notification whenever a new update is posted. 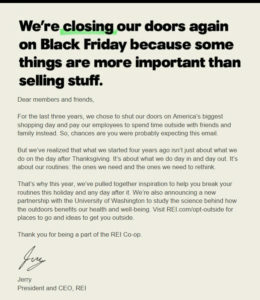 With new developments to the #OptOutside campaign, REI continues to support and advance its culture and its brand. In Chapter 8 of FUSION, I describe how REI initially conceived of its now renown campaign. Its leaders wanted a very visible and tangible way to reinforce its values and culture which is all about the love of the outdoors, so they decided to pay employees to spend Black Friday outside instead of working indoors. The company turned this decision into an #OptOutside brand campaign, in which it also encouraged customers to get out into the outdoors instead of shopping inside. In 2014, the first year REI ran the campaign, REI estimates it got 1.4 million people to enjoy the outdoors instead of going shopping that day. And it created a movement of encouraging outdoor activity that is supported by more than 700 organizations. So the company has compiled a bunch of resources online including how-to articles on outdoor activities like mountain biking and camping and a location-based list of parks and trails. It’s also investing $1 million to support the launch of a new initiative within the University of Washington’s EarthLab that will study the link between human health and time spent outdoors. “Nature for Health” research includes testing the benefits of wilderness hiking among veterans with post-traumatic stress disorder. These efforts contribute to the powerfully authentic way that REI continues to increase its impact as a brand and fulfill its purpose: To inspire, educate and outfit for a lifetime of outdoor adventures and stewardship. The former NFL quarterback, who sparked a movement of protests over racial injustice by kneeling during the national anthem and is now suing NFL owners for allegedly colluding to keep him out of the league, is a controversial figure. People from both sides of the protest have been vocal and vitriolic about his actions. Perhaps that’s why Nike included him. The brand has never shied away from taking controversial stands. 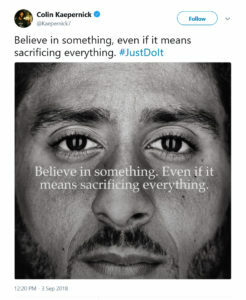 From maintaining support for Lance Armstrong long after most other companies withdrew their endorsement deals to featuring Mohammed Ali in its ads despite his polarizing character, Nike has seemed to care less about what the average person thinks about it than about staying true to its mission and core values. In the introduction of FUSION, I herald Amazon as a prime example of a company that’s achieved and is leveraging the alignment and integration between external brand identity and internal company culture that is needed to live up to customers’ expectations. But a new development at the company could threaten Amazon’s brand-culture fusion. It just announced that it is signing up entrepreneurs — “Delivery Service Partners” — to start their own package delivery fleet. It’s the company’s latest attempt to solve the “last mile” problem of e-commerce delivery — fulfilling online orders fast at scale — while reducing its shipping costs which now amount to over $22 billion. 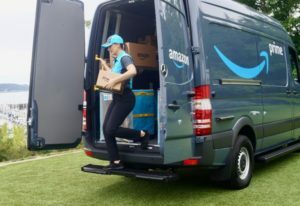 The program, through which Amazon provides discounts on vehicles, uniforms, fuel, insurance, and more, allows enterprising individuals to run a package delivering service with up to 40 vehicles with up to 100 employees. Pitched as “a way for entrepreneurs to operate their own delivery business without worrying about sales activity,” the program is available to folks for as low as $10,000 and Amazon estimates participants can earn up to $300,000 annually in profit. At first blush, this seems like a genius solution. It’s kind of like a franchise business, wherein the franchisor allows others to leverage its business model, brand, and operations and systems to start up their own company. It’s a win for the franchisor (which is able to grow at a faster rate but lower cost) and for the franchisee (which is able to start a business with less risk and effort.) It also seems to create value like other gig-worker enabled business such as Uber, which open revenue generating potential to individuals. But I wonder if this new program introduces the potential of too much variability in service quality? The service will be branded Amazon Prime, so these new delivery providers represent the Amazon brand. Will they be steeped in the customer service values and standards that we’ve come to expect from Amazon? Will they be as “customer-obsessed” as Amazon corporate employees are? Will their service be not only timely service, but hassle-free and seamless? Successful franchisors carefully vet and inculcate franchisees with their culture. Reflecting the stringent standards that the fast food chain Chick-fil-A applies to its franchisees, it’s been said that it’s easier to get into the CIA than it is into Chick-fil-A. As Uber learned the hard way with some of its drivers, “partners” don’t always embody the brand the way they’re supposed to. Without the systems and processes in place to ensure its new partners embrace Amazon’s culture, the company’s brand could suffer. I certainly hope Amazon has worked through these considerations…but only time will tell. Despite serving as the U.S. President’s personal communications channel, Twitter’s future has been in question. Its total monthly active users and average revenue per user lag far behind Facebook. It’s no surprise, therefore, that CEO Jack Dorsey announced a sweeping reorganization. The change organizes Twitter into functional groups, such as engineering, instead of around individual products. 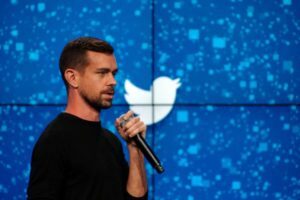 According to Dorsey, Twitter is “moving back to a functional organization” from a “GM structure,” which will better serve the company’s needs and vision. “A pure end-to-end functional organization will drive clearer decision-making, enable us to foster stronger culture…and most importantly, sets us up for more creativity and invention, which is the phase we must now enter to continue to be relevant and important to the world,” Dorsey explained in a series of tweets. It’s a terrific example of Organizing and Operating On Brand, Chapter 4 of FUSION. I explain that business leaders should apply design thinking to match their organizational design to their desired culture. You can use organizational structure to facilitate the relationships that will promote your desired culture and advance the priorities that you want your culture to embody. This is exactly what Dorsey has done. But lately the state of brand-culture fusion at the company seems to have not been as healthy as I had found in the research I had done when writing the book. In recent months, reports of inappropriate behavior by executives at Nike have come to light. Trevor Edwards, brand president and heir apparent to the CEO role, have since left the company along with several other executives, and CEO Mark Parker has had to undertake efforts to repair the organization’s culture and restore morale. It’s unclear how long Nike’s brand identity and workplace culture have been out of sync. Equally uncertain is whether or not attempts to close the gap will be successful. Perhaps the only definitive conclusion that can be made at this time is how fragile and elusive brand-culture fusion can be. Even if you have it at some point, you can’t take it for granted and assume it will sustain itself. And if you have it in some areas of your organization, you can’t assume that it exists throughout. Efforts to cultivate the integration and alignment of brand and culture must be sustained and comprehensive. Employees are starting to organize around social and political issues and pressure their companies to do something about them. Examples include Google employees protesting the company’s involvement in a Pentagon drone strike program and Amazon employees trying to push management to stop running ads on Breitbart News. 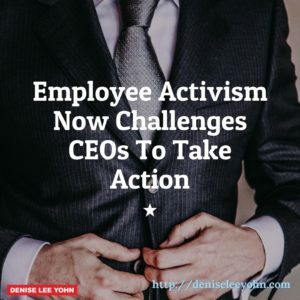 I wrote about this development in a recent Smartbrief article and encouraged CEOs to give it careful attention because this sort of employee activism is only going to grow and require active management. Employee activism influences brand perceptions, so it’s relevant to brand-culture fusion. Perceptions of Google among certain stakeholders had probably been shaped by its involvement in a government program related to warfare. But when that involvement came to light because employees drew national media attention to it, the Google brand integrity came under broader scrutiny. Employees questioned Google’s involvement in something that seems to conflict with the company’s founding mission, “Do no evil” and its values and culture in general. Eventually the leaders at Google decided to withdraw from the program, and in doing so, they seemed to restore alignment between brand identity and organizational culture. The action sent a message about how internal dynamics influence external actions at the company — even if reactively. Other companies should be as conscientious when similar issues arise. Moreover, business leaders should get out in front of potential issues. When a CEO clearly articulates the organization’s core values, cultivates the culture around those values, and operates the business in line with those values, the organization is more likely to attract employees who support those values and less likely to find itself in situation where incongruence leads to damaging employee activism. Culture should be linked to customer experience. A unique culture is a valuable one. Culture-building should driven by leaders but shared by all. Underlying these three lessons about culture-building from Bezos’s letter is perhaps the most important take-away from it. 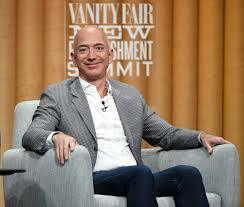 He reminds everyone that Amazon is staying committed to the core values they set at the inception of the company, writing, “This year marks the 20th anniversary of our first shareholder letter, and our core values and approach remain unchanged.” Few leaders have the discipline and commitment to remain as steadfast to their culture as Bezos has — especially through turbulent times such as those of the past 20 years — but that’s what great leaders do. Read the full column here — and read more about Amazon’s culture in the Introduction of FUSION. One company that I didn’t write about in FUSION, but wish I had, is Microsoft. In the 18 months that have passed since I started working on FUSION, it’s become very clear that CEO Satya Nardella has executed a remarkable turnaround at that company partly by leading a cultural transformation. 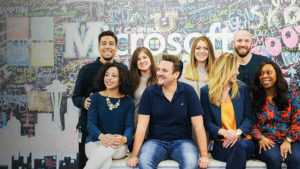 My colleague Hilton Barbour had the opportunity to talk with Microsoft Canada’s Head of HR Cherise Mendoza about her company’s resurgence and how a new perspective and approach to teamwork and leadership is powering Microsoft today. Check out the excellent interview here. In light of the current controversies surrounding the company’s involvement in Cambridge Analytica’s violations of user privacy, the appropriateness of such an idealistic purpose is now being questioned. The Washington Post recently reported on a 2016 employee memo in which a Facebook executive defended the company’s questionable data mining practices and championed its pursuit of its purpose at any cost (including possibly death). After BuzzFeed published the leaked memo, Zuckerberg provided a statement saying, “Boz is a talented leader who says many provocative things. This was one that most people at Facebook including myself disagreed with strongly. We’ve never believed the ends justify the means.” Bosworth himself acknowledged that he intended the memo only to start a debate. “I didn’t agree with it even when I wrote it,” he posted on Twitter. A higher purpose — one beyond making money — is an extremely powerful way to differentiate your organization, unite your stakeholders, and ensure you play an invaluable, irreplaceable role in people’s lives. Facebook demonstrates that you must think your purpose through and then operationalize it carefully. Wells Fargo could serve as the poster child for the kind of brand-culture disconnect that I wrote FUSION to help business leaders avoid. The deceptive practices that were uncovered at the company — employees creating phony bank and credit card accounts in customers’ names without their permission — surprised people not only for how wrong they were but also for how opposite they were from the bank’s wholesome brand image. Wells Fargo, with its old-fashioned logo, symbolic stagecoach, and snowmen holiday ads, seemed to be a wholesome, service-oriented brand. But the scandal revealed what the organization was really like. Its culture was characterized by extremely aggressive — and somewhat arbitrary — performance targets. Employees were given incentives for how many new accounts they open or for meeting sales goals and managers drove their employees to hit the targets at all costs because they didn’t want to miss out on their bonuses. What a brand-culture mismatch! 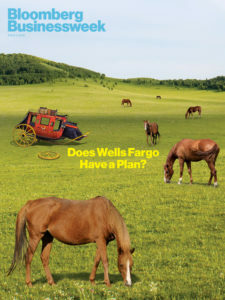 The Businessweek article reported on how Wells Fargo has suffered as a result of the scandal. Its net income fell 5%, while income rose 14% across the rest of the U.S. banking industry. It lost market share in deposits in most states and it plummeted from the top 20% of brands in terms of consumer trust to the bottom half. And the Federal Reserve has capped the amount of assets Wells Fargo can take on until the bank improves internal oversight, so its growth prospects are limited as well. In FUSION, I write about Adobe Systems in Chapter 4, Organize and Operate On Brand. I describe how the company applied design thinking to its organizational design and combined departments, added new roles, and streamlined the number of its office locations to cultivate a more agile, customer-oriented culture. But I could have easily written about Adobe in the chapter Create Culture-Changing Employee Experiences (#5) and shared about its ground-breaking approach to integrating customer and employee experience. 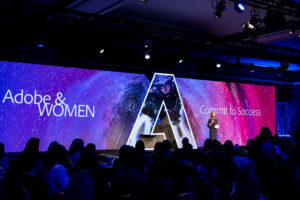 I had the opportunity to interview Donna Morris, Adobe’s EVP of Customer and Employee Experience, about her dual responsibilities to attract, engage, and develop employees and customers. Check out this write-up to learn the why, what, and how of fusing CX & EX. Every year, Fortune magazine partners with the Great Place to Work organization to compile its annual list of the 100 Best Companies to Work For. To make the list, they survey millions of employees and conduct a culture audit on each company to review its benefits and people programs. creating a globally-cohesive culture — in addition to the U.S. list, Salesforce also ranks on each of Fortune’s national best workplaces lists in Australia, India, Ireland, Japan, Singapore, and the U.K.
It’s no wonder I feature Salesforce in FUSION — check out Chapter 6. The New York Times ran a feature on WeWork, the global network of shared office spaces. In a very short period of time, the company has expanded to 20 countries, 200,000 members, and $2.3 billion in revenues. On one hand, it makes sense that companies want to tap the design sensibilities of the experts at WeWork who seem to have nailed a type of workplace environment that attracts the type of worker — younger, more social, collaborative — that is in high demand in many industries. But is it wise to outsource such a critical influence on corporate culture? I advise company leaders to cultivate a unique culture so that their employees develop the specific attitudes and behaviors needed to produce the specific results they’re looking for. That’s a lot harder to do if your workplace is the generic, albeit hip and cool, environment such as what WeWork offers. 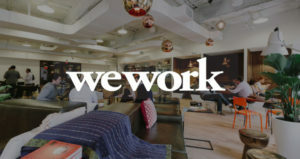 I’m guessing WeWork’s rise will continue for awhile as many companies wake up to the realization that their workplaces lack the energy and distinctiveness they need to compete in the war for talent. But in the long run, I hope that business leaders will assume ownership developing their own environments and employee experiences that cultivate their unique desired cultures. Read about the importance of workplace environment in FUSION Chapter 5, Create Culture-Changing Employee Experiences. 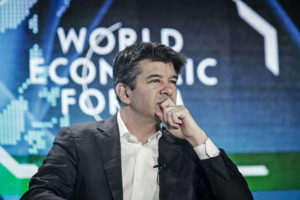 Bloomberg Businessweek writers Brad Stone and Eric Newcomer describe what happened behind the scenes that led to the departure of Uber CEO Travis Kalanick from the company he co-founded and led. Kalanick’s comment reveals how he, and many other business leaders, fail to understand how these days a cultural problem can easily become an image problem — and ultimately a real business problem. People now have the ability — and the proclivity — to scrutinize how companies operate. They can see for themselves whether or not a business aligns with their perceptions of it, and their own personal values, and make their purchase decisions on their judgment. That’s why it’s critically important for business leader to ensure there is no disconnect between how they want their company to be perceived and how it really operates. This is what FUSION is all about. Check out the Introduction chapter for free to learn more about why and how to integrate and align your brand and culture. This describes the incredible influence an organization’s leaders have on its culture — it really can’t be over-stated. It also should be noted that while morale was following the Kalanick’s decline, Uber’s financial performance also began to suffer. It’s no coincidence that rider growth rate slowed compared to Lyft, losses continued, and the company is now valued at 30% lower than it once was. Leadership and culture crises can cause real damage to a business. Read about how culture is a strategic management responsibility in Chapter 3 of FUSION: Lead the Change. Salesforce CEO Marc Benioff sat for an interview with FT columnist Rana Foroohar and offered thoughts about the culture crisis that seems to be looming over Silicon Valley. His remarks included a very telling observation: “I mentor a lot of CEOs and entrepreneurs and when I see that product is the number-one thing,” he said. “The only thing that matters, that’s a real red flag.” Benioff explained that the focus on product to the exclusion of all else is something that tends to accompany poor leadership behavior. He speaks with credibility on the issue. 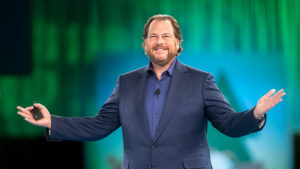 He’s put the values and culture of his organization first and that has enabled Salesforce to grow as successfully as it has and Benioff to avoid the negative image that most tech CEOs have had to grapple with lately. Learn more about Salesforce in Chapter 6 of FUSION: Sweat the Small Stuff. The article also reports on the new Salesforce Tower in downtown San Francisco, which is now the tallest building west of Chicago. The building includes an “Ohana” floor (“family” in Hawaiian) which is intended for use as “a company-wide hang-out and venue for non-profits to use in the evening and at weekends.” Benioff explains the floor saying, “I just want this to be something more open — this can’t be just one person’s experience, everyone needs to be able to come here.” The floor is the newest artifact that Salesforce has created to commemorate and advance its Ohana culture. Chapter 6 of FUSION explains how artifacts and rituals serve as “memory triggers” of your desired culture and the daily behaviors you expect from employees. Check back soon for more FUSION updates or sign up using the form at the top of this page to be notified whenever new content is posted.